Hail and Farewell! * I’m Janice Johnson. Thanks for joining the fun here on Maladjusted Mondays. Linda heroically offered to host this collection of scathing exposés in which I rat out my uncooperative appliances. 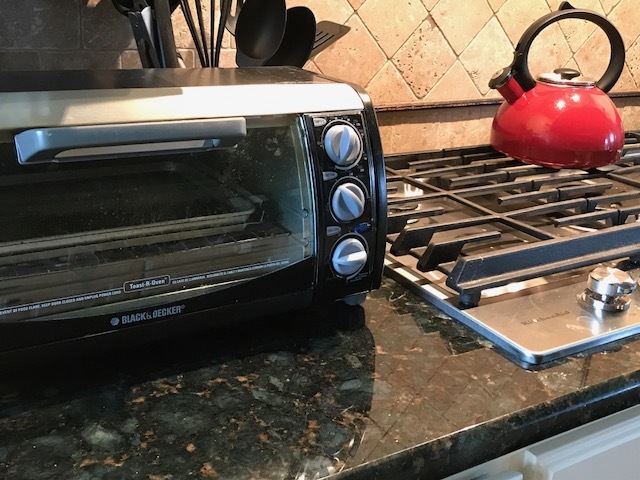 I originally published these posts on my blog, Joywriting: Everybody Has a Story, where I do occasionally write about something besides my appliances. You can visit me there any time by clicking here. * This week, I changed my usual “Greetings!” to “Hail and Farewell!” — because today’s is the last appliance-wars post I currently have to offer. This, of course, does not mean that my appliances intend to live meekly ever after. With Linda’s permission, I will submit reports on any new uprisings or shenanigans that may occur in the future. And now for the 18th post in the series, which first appeared on my blog June 5, 2018. How do you fail at Pandora? To be clear, I’m talking about the online-radio app, not the charm bracelets. 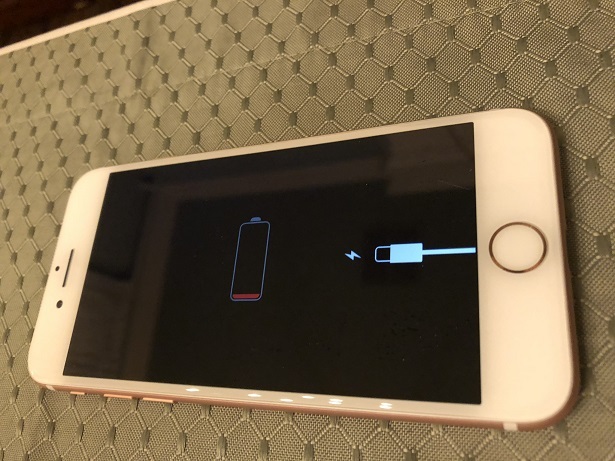 Technically, it’s just an app, not an appliance… but I shouldn’t have been surprised. Sunday evening, we had our Liberian friends and several friends from church at our house for a potluck dinner. 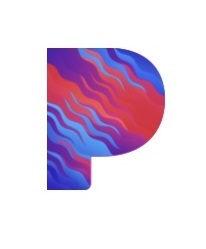 I set Pandora on an uplifting worship music station and put it through the speakers. Everyone arrived, we set up the food, and people visited while munching chips and salsa. Then it was time to start eating in earnest. We bowed our heads for prayer, and Brent thanked the Lord for the friends and food. He had barely started speaking when I heard a feminine voice say, “Uh-ohhh…” Thinking something had spilled, I glanced around to see whether anyone needed a towel or mop. No, all heads were bowed. That’s when I heard the voice again. This time I realized it was coming from the speaker above my head. … a commercial for diarrhea medicine. Could there be a more ominous start to a meal? We got through the prayer with only a few snickers. Now we’re all thankful, not only for friends and food, but for laughter. And the fact no one needed any medication after dinner. Thanks for read– Wait! NEWS UPDATE! The Very Next Day after this post went live on my blog, I got an email from LinkedIn, touting several job openings they thought would interest me. The first one was for a marketing copywriter. PS: NO, I did NOT apply for the job. Thank you. Greetings! I’m Janice Johnson. Thanks for joining the fun here on Maladjusted Mondays. Linda heroically offered to host this collection of scathing exposés in which I rat out my uncooperative appliances. 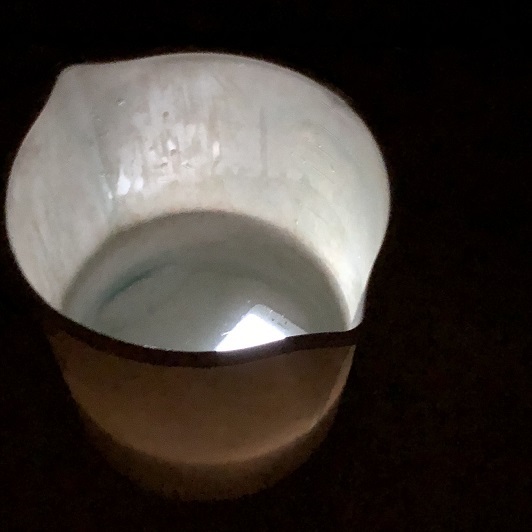 I originally published these posts on my blog, Joywriting: Everybody Has a Story, where I do occasionally write about something besides my appliances. You can visit me there any time by clicking here. And now for the 17th post in the series, which first appeared on my blog May 15, 2018.
and generates a steady supply of hairballs? In our case, it is not a cat. No, it’s the Roomba that Brent gave me this past Christmas. It’s been in our house four months, and I’m still trying to figure it out. Correction: I should say “her.” Because we named it Hazel, after the old-school TV comedy starring Shirley Booth. Anyway, Hazel does a creditable job of dusting the floors. She glides under the furniture with ease and bumps her way around obstacles. But she isn’t all diligence and efficiency. 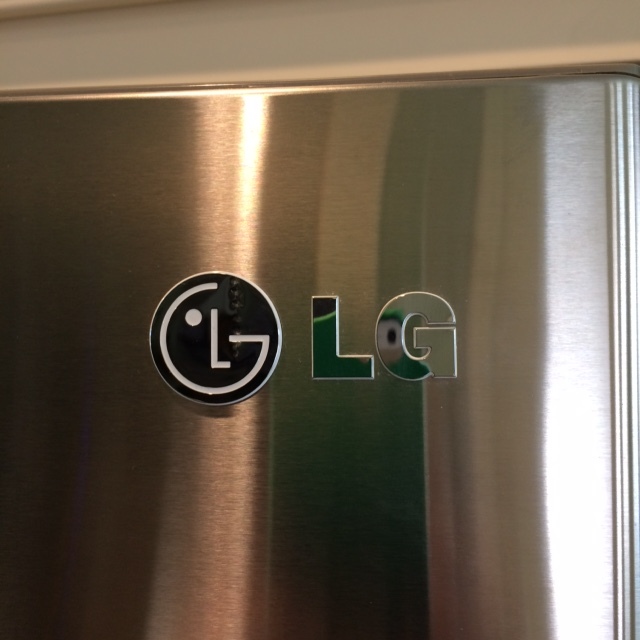 A diligent appliance? At our house? One evening, Brent could only find one sock of a pair he’d left on the floor. Hazel had done her rounds, so of course he asked me whether she’d eaten it. But the sock was nowhere else, so I went and turned Hazel over. Sure enough, she had picked up the sock–then dusted half the floors with it hanging out of her mouth. I wrestled the sock away from her, only to find she had also coughed up a hairball. Or more accurately, crafted one out of someone’s long grey hair. Can I help it if I shed? A few minutes with the kitchen scissors took care of it, but I’m betting this hairball won’t be her last. Just yesterday, I put Hazel in our bedroom and shut the door so she wouldn’t wander out into the living room, which was already clean. Half an hour later, I realized I didn’t hear her high-pitched humming. I went to the bedroom door and listened. Nothing. So I turned the knob and pushed the door open. Half an inch. Then something blocked it and three beeps sounded. I had to go find my house key, people! And there she sat, right in front of the closed door, not doing a single thing. 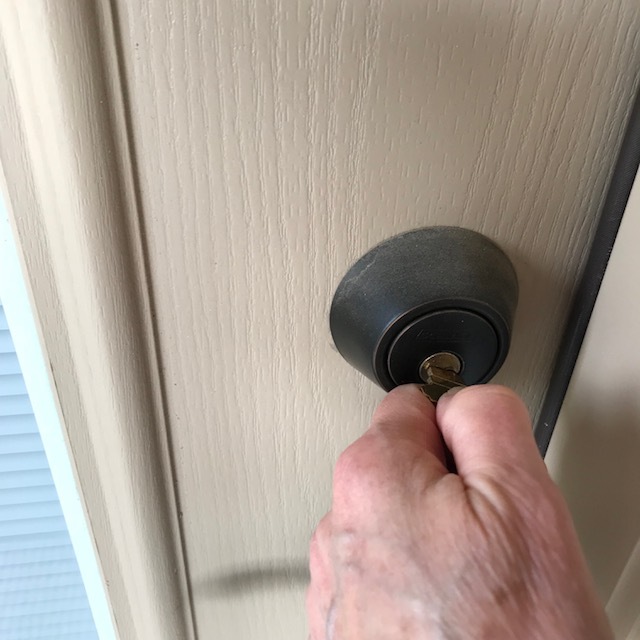 I still don’t know why she stopped, but after I opened the door, pointed her out, and pushed the “Home” button, she was able to find her way back to the docking station. Believe me, I followed her every step of the way. And people wonder why I don’t program the thing to work while I’m away from home. Greetings! Janice Johnson here. Thanks for joining the fun on Maladjusted Mondays. Linda heroically offered to host this collection of scathing exposés in which I rat out my uncooperative appliances. I originally published these posts on my blog, Joywriting: Everybody Has a Story, where I do occasionally write about something besides my appliances. You can visit me there any time by clicking here. And now for the 16th post in the series, which first appeared on my blog November 24, 2017. Brent and I both love hazelnut butter, but there’s so much sugar in the commercial stuff! Then a friend gave me her recipe for a healthy version. I found a source for blanched hazelnuts, Brent ordered a killer blender, and I’ve been making my own nut butter ever since. 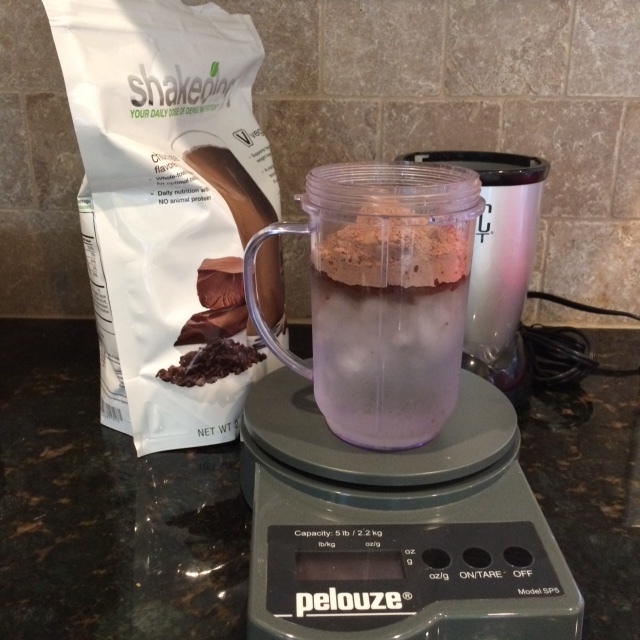 Here’s the blender, photographed beside the protein-shake one for scale. If the little one is a Bullet blender, the big one is the Howitzer of blenders. The craving hit recently while I was out of hazelnuts. 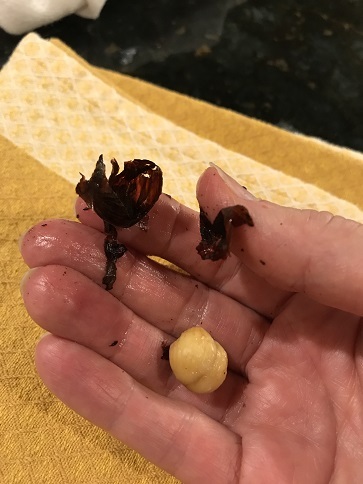 Undaunted, I brought a pound of in-the-shell nuts home from the grocery. But in the back of my mind was the nagging realization that, for the first time, I’d have to blanch the nuts. I approached this task with the same confidence with which I might gut a fish. However, you can look up anything online, including how to blanch hazelnuts. I boiled the nut meats according to the directions. It took longer than I expected, but at last the papery skins slipped right off. The nuts looked bigger and puffier than the pre-blanched ones I’d bought before. Should I be uneasy? … Naaah. Next step, toast the skinned nuts in the oven. Since they had apparently retained a bit of water, I made sure they were fully toasted. Then, into the blender they went. Here they are, coarsely chopped and on their way to smooth, dippable greatness. 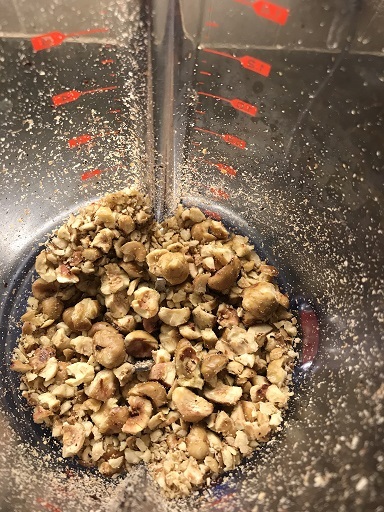 Once the nuts were pretty well pulverized, I added the other ingredients and blended some more, pushing the stiff goop back down into the blades every ten seconds or so. Usually this “stiff” phase lasts about two minutes. Half an hour later, the consistency hadn’t changed a bit. If anything, the goop had grown stiffer. By now I could only blend for four seconds before the blades would lose all contact with the hazelnut goop. I let the blender cool off for a while, and went at it again. Maybe I had over-toasted the nuts. I added water. An hour later, I gave up and scooped the resulting hazelnut product into a container to refrigerate, ready or not. And this time, I can’t even blame the appliances. One thing’s for sure: From now on, I’m only buying already-blanched hazelnuts. After all, I’m not completely nuts. And now for the 15th post in the series, which first appeared on my blog November 14, 2017. I’m starting to realize the grim truth: I’m outnumbered and surrounded–by my appliances. Last week, the toaster oven and the gas stove rebelled… on the very same night. In support of our quest to eat more super-healthy foods, I picked up some sea scallops on special. A salad and a dish of fresh veggies, ready for stir-frying, sat in the fridge. The plan? Broil the scallops and cook a batch of quinoa to go with them, while stir-frying the, um, stir-fry. But I reckoned without those appliances of mine. According to the package directions, quinoa cooks up like rice, taking about 15 minutes to absorb all the water once it’s come to a boil. So when the quinoa and water boiled, I turned down the flame to simmer, again according to directions. Then my attention turned to the plump discs of seafood greatness. It seemed silly to heat our large oven just to broil 3/4 pound of scallops, so out came the toaster oven. Lightly crumple up some foil, spray it with olive oil, and fit it into the shallow toaster-oven baking sheet. Boom — a makeshift broiling pan. After giving the quinoa a sportsmanlike head start, I set the toaster oven to “broil” and cranked the temperature all the way up. A dash of olive oil on the neatly arranged scallops, and into the oven they went. Now for the veggies. Several stir-frying minutes later, I opened the toaster oven to turn the scallops. To my horror, they weren’t browning on top. 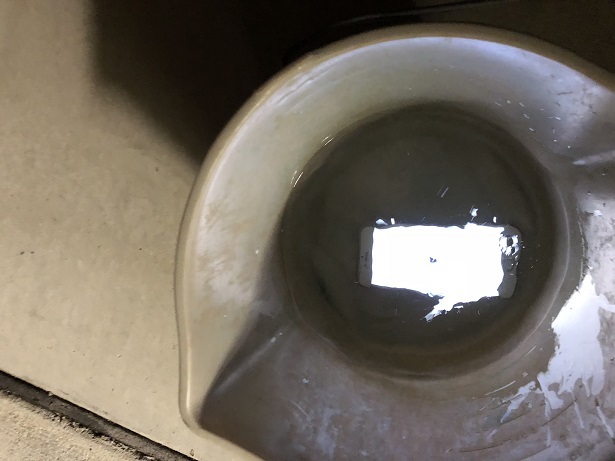 A broth had formed, nearly filling up the makeshift foil pan. The scallops looked more like they were relaxing in a hot tub than getting cooked. I’ll spare you the sad details of scallop broth splashing over the floor as I ferried the little pan to the sink. No seafood was left behind, though. 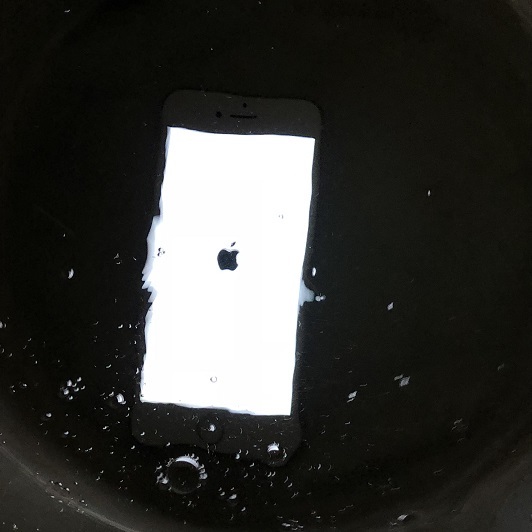 Or in this case, none went down the drain. I’d have to sauté the scallops. Fine. I shoved the veggies to one side and popped the scallops into the same skillet. Minutes later, they were ready. Great–now to serve up the quinoa. I lifted the lid to access the fluffy side dish. Instead, the little seeds literally floated around in the pan, still up to their necks in water. Here we had yet another hot-tub party, and me not even invited. Tasting a few grains, I found them pretty much done, so I cranked up the flame to accelerate the process. Eventually everything was done enough, the floor mopped up, and dinner was served. Perhaps some day I’ll be able to regulate the stove flame, and maybe even find a true broiling pan that will fit in the toaster oven. Meanwhile, sandwiches sound more appealing all the time. And now for the 14th post in the series, which first appeared on my blog October 2, 2017. On a recent trip to Washington state, Brent and I took a road trip to his boyhood home town. The next day found us driving for hours through the Cascades to get back to our kids’ house. Construction detours, rain, no cell service, verrrrrry spotty map info, snacks but no real lunch… Relief flooded us when, at about 1:00 PM, we finally came to Packwood–an actual town. To our delight, we spotted a scruffy old pizza-and-burger place with beat-up pickups and motorcycles parked out front. In a charming bit of anachronism, the ladies’ room boasted a contemporary wall-mount foam soap dispenser and a sleek cylindrical paper towel holder. 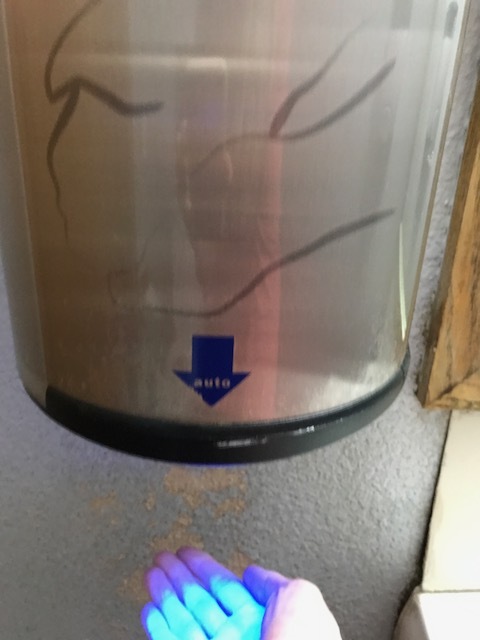 In due time, I washed my hands and reached under the cylinder for the corner of paper towel that should be sticking out. I didn’t feel any. Just as I was about to frisk the holder more thoroughly, a deafening noise like a jet engine filled the air. At the same time, my outstretched hand came alive with an intense, eerie blue glow. Adrenaline jolted me halfway across the room. Clearly, this was an alien abduction. I regained my balance. Thankfully, both the shrill engine noise and the blue light faded away. Once my heart started beating again, it dawned on me that the “paper towel holder” must really be a warm-air hand dryer. What I’d really like to know is how on earth the appliance revolt spread clear to the state of Washington. It’s like they knew I was coming. I’m no dummy… I wiped my hands on my pants. But you might want to steer clear of the “paper towel holder” in the ladies’ room. And now for the 13th post in the series, which first appeared on my blog May 29, 2017. Not gonna lie… we’re total newbies at having a swimming pool. 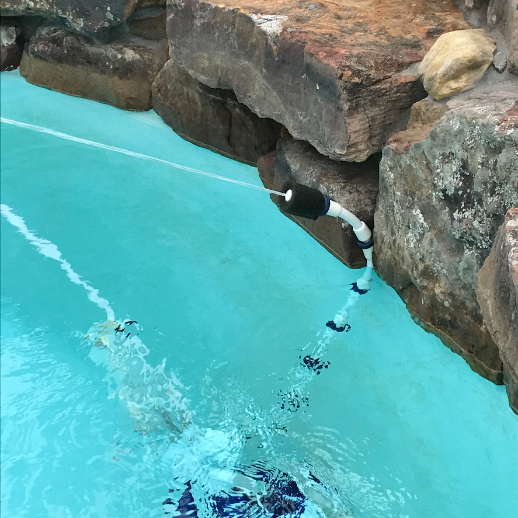 I mean, we don’t trust ourselves to take care of it, but have professionals maintain the pool lest it end up infested with mold or jellyfish or something. 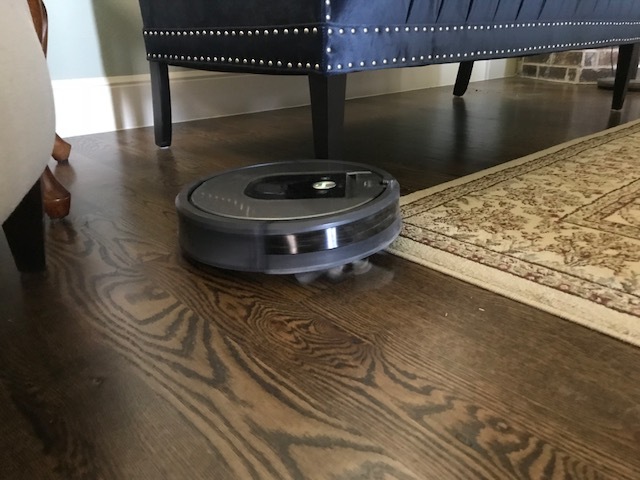 Adding to the pool’s entertainment value is an automatic cleaner that roams around the bottom and sides, looking like a cross between a Roomba and a defibrillator. 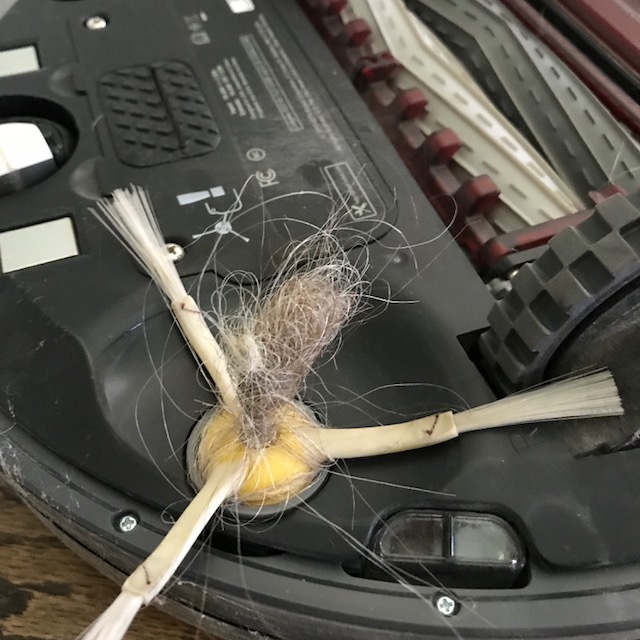 It vacuums water in through the Roomba end, filters it, and pees it out via a three-foot hose. The hose swishes around, sometimes breaching the surface and squirting a bit of water onto our breakfast room windows. Last Saturday, I glanced out the breakfast room door and was startled to see rain blowing into the patio. 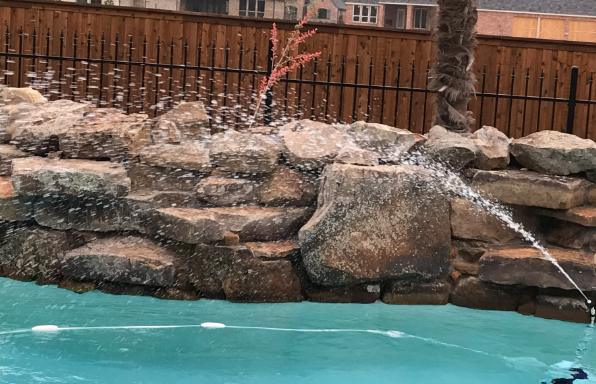 Going out to investigate, I found the “rain” was actually arcing up from the pool, thanks to the Roomba hose, which would surely re-submerge in a second. Any second now. . .
Oh, wait. Maybe I’d better get the skimmer and un-wedge the spray end of the hose from that crevice between the rocks. After freeing the hose, I checked around to find a puddle in the adjacent flower bed, and another in the lawn just beyond. My personal rainstorm must have gone on for at least ten minutes. 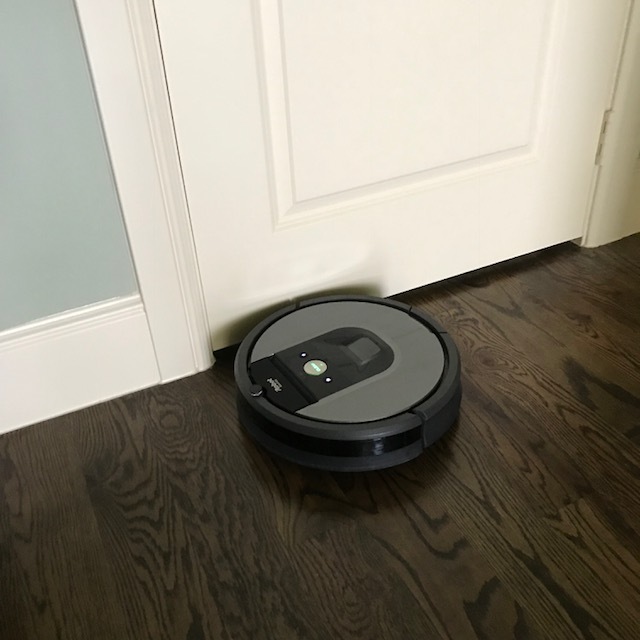 Apparently, the Pool Roomba has made friends with my other appliances and joined the revolt. And now for the twelfth post in the series, which first appeared on my blog May 24, 2017. My brother, David, and I drove to the town of Nevada from different directions. Next day, we agreed to each find our way north to Warsaw and meet at the Common Ground Cafe for lunch. His rental car had an add-on navigation system, and my Infiniti of course has the latest version of GypsE ROSE. What could go wrong? 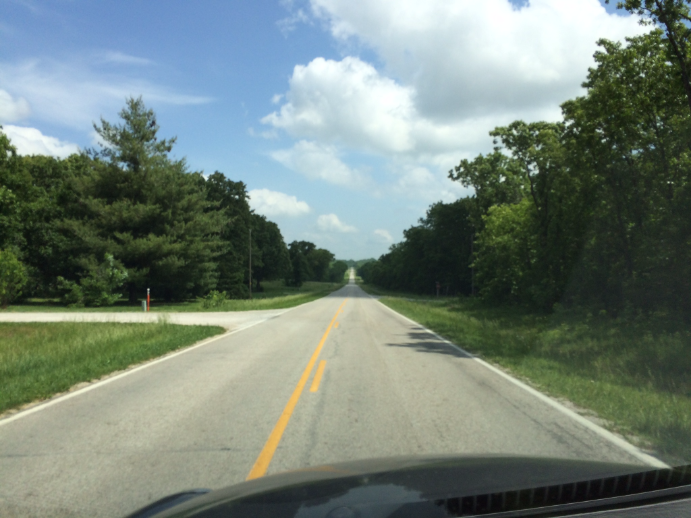 My route meandered up state highways alongside the Truman Reservoir before veering off onto a local road that approached town from the “back” side. At length I came to Highway 7, where I expected to turn right. But GypsE ROSE said to cross it. 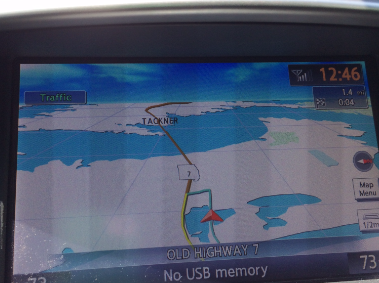 The map showed me turning right just past 7, and crossing a bridge into town. Fine. I turned off where indicated. Moments later, there was the bridge. A footbridge. You know… for pedestrians. “Not driving over that.” I pulled into a convenient parking lot to reconnoiter. The cafe was only a half-mile away. Why not walk? Soon I saw the store. 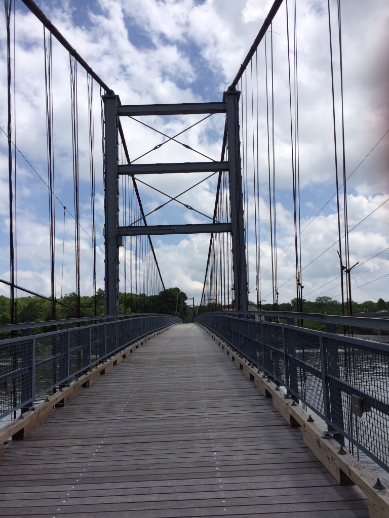 Something stood between me and it: Highway 7 and some fast-moving traffic.”Not walking across that.” Back over the bridge and into the car. As soon as I turned to retrace my route, the map guidance changed to show me taking Highway 7 into town and turning onto Main. “Why didn’t you say so in the first place?” I demanded. When we were seated, he told me his own nav system tale. . .
David couldn’t get a word in edgewise. Desperately trying to kill the phone and end this mechanical stalemate, he missed his turn and drove two miles before finding a place to turn around. By the time he got to Warsaw, he figured I’d be tired of waiting for him. Greetings! I’m Janice Johnson. Thanks for joining the fun here on Maladjusted Mondays. This series is a collection of scathing exposés in which I rat out my uncooperative appliances. (Thanks to Linda for hosting me!) I originally published these posts on my blog, Joywriting: Everybody Has a Story, where I do occasionally write about something besides my appliances. You can visit me there any time by clicking here. And now for the eleventh post in the series, which first appeared on my blog March 1, 2017. When last we left Jan, she was wiping splashed protein shake from her face and was about to clean up the (major) portion that had dripped behind the refrigerator. Spill + 3 minutes: Step one– Pull the fridge out away from the wall. Spill + 4 minutes: Step t–wait, I’m still tryna move the fridge. Spill + 11 minutes: It simply wouldn’t budge. I looked everywhere for the user manual. Spill + 18 minutes: I couldn’t find any manual, so I looked it up on LG’s website. The online manual showed how to do every possible thing you might ever want to do with a fridge…. EXCEPT move it. Spill + 24 minutes: I got on phone with a very nice person at LG, who spoke pretty good English as long as she didn’t have to stray from the script. Spill + 25 minutes: We had to stray from the script. As near as I could tell, she was claiming that I first had to retract the wheels so that the feet, not the wheels, were touching the floor. Besides, I couldn’t even see the wheels OR feet, because a handy rubbery barrier like a giant squeegee blocked my view. You couldn’t get too mad, I guess, since it probably saved hundreds of green peas and blueberries from rolling under there and going bad. Spill + 1 hour, 13 minutes: Brent came home. Spill + 1 hour, 14 minutes: Brent wished he hadn’t come home. Spill + 1 hour, 27 minutes: Brent somehow figured out how to get those stupid wheels to turn. By the time we got the fridge rolled forward enough to clean behind it, I figured the shake mix would’ve dried up and I’d have to sort of chip it off the wall and floor. 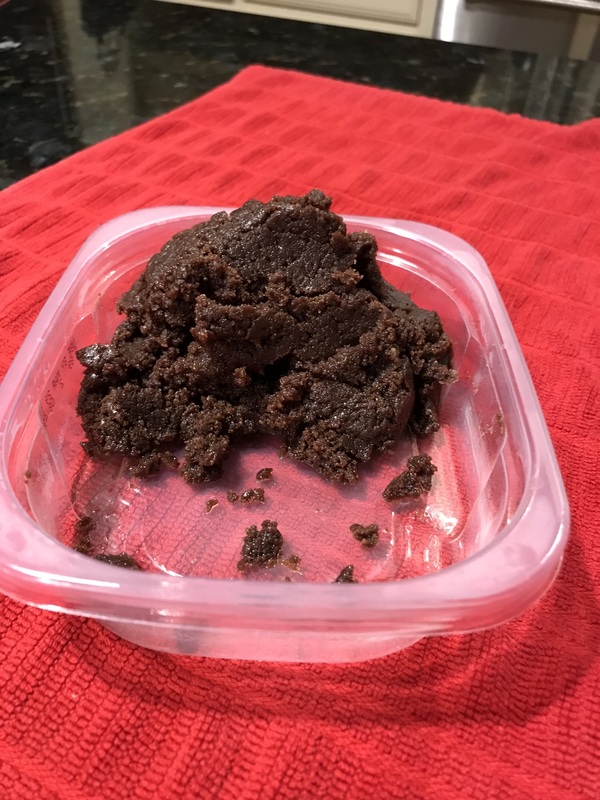 Not so… the protein had coagulated into wet, sticky, dark brown clots. My kitchen floor looked like a violent-crime scene with dust bunnies. That happened about a year ago, and I’m still having flashbacks. I can assure you, though, that every time I serve up a scoop of protein-shake powder, I turn well away from the blender before re-closing the bag. Maybe I should get a roll of Crime Scene tape, just in case. And now for the tenth post in the series, which first appeared on my blog February 27, 2017. Seriously, I still can’t find an honest appliance anywhere. And if they’d only cooperate, I could really use their help with my fitness goals. See, I don’t mind being kind of matronly, but I don’t want to overdo it. So not only do I exercise, but I also try to go easy on my beloved carbs and take in more protein instead. 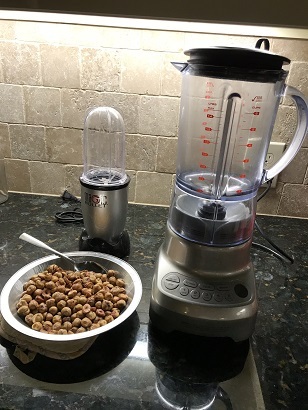 I rely on my bullet blender for a smooth protein shake. Protein shake powder? Great. Especially in chocolate. Recloseable press-and-seal zipper bag? Wonderful. Zipping the bag closed while standing right next to a bullet-blender cup full of protein powder, ice, and water? One night I was fixing a shake and had set the ice-and-water-filled blender cup on my postal scale to measure the powder. Turns out, the postal scale and the bullet blender are in cahoots. Gripping one end of the bag with my left hand, I used my right to pinch the zipper closed. I did this by getting it started and then squeezing while pulling my right hand across the top, away from my left. Everything was fine until somehow my right hand slipped off the shiny bag. I sighed and set the nearly-empty blender cup back on its feet. Clearly, I had some mopping up to do. A pain in the neck, but at least mopping is simple enough…. right?